In a small skillet, heat half of the peanut oil. Sauté half of the shrimp, stirring and tossing frequently, until cooked, about 4 minutes (shrimp will turn pink and become firm). Do not overcook. Transfer the shrimp from pan with a slotted spoon into a small bowl. Repeat cooking process with remaining shrimp. Pour 1/4 cup red wine vinaigrette over warm shrimp and let stand for an hour. Trim snow peas and drop them into a kettle of salted boiling water. 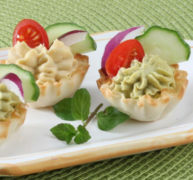 Let them cook for about 2 minutes; drain immediately and plunge into a bowl of ice water to stop the cooking process. When completely cool, drain them and pat dry. Drain and chop shrimp and then chop snow peas. Combine shrimp and snow peas in a bowl and then spoon into Phyllo shells. Top with crushed crackers for garnish and serve. 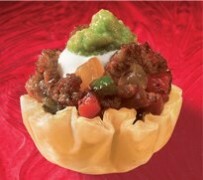 These appetizers feature Tex-Mex favorite beef fajitas in a light, crispy Mini Phyllo Shell.